A reedy, chocolate-brown 22-year-old woman wearing thick-rimmed glasses walked in, as nondescript as the conference room where I waited. “Hello,” Nadja Sampson murmured almost as lightly as one would expect from her thin build. But her impending story revealed a weight that very few of us could carry. “I lived with my mother, my younger sister and occasionally my youngest brother in an abandoned house in one room in Jackson, Mississippi … before moving to New Orleans to attend college,” Sampson began. We were in Liberty’s Kitchen of New Orleans, a group that uses food service-based training to place vulnerable youth from ages 16 to 24 on a road toward self-sufficiency. A snapback featuring the Liberty logo covered her short, natural hair and the hat’s extended brim didn’t quite touch her frame. Related: Elite colleges sound the call to reshape admissions – but will it spur any concrete changes? A lack of financial support grounded Sampson’s original college flight. But the eloquence with which she articulated her journey from living in an abandoned home to going to college showcased her aptitude as well as a disbelief that she would be anywhere other than a postsecondary institution. More than personal insecurities, price and debt-load put her college choice out of reach, as it does for many low-income students. Financial aid policies don’t sufficiently address what families feel they can afford. “That Parent Plus loan that they offered – [my mother] couldn’t qualify for, so that was an extra $1,500 out of pocket, which was something we couldn’t afford,” Sampson said. Spoiled? Basics aren’t luxuries one should feel spoiled over. There should be no shame in her returning to New Orleans from Jackson during the summer to try to pay off school loans and get back into Xavier. Working more than 15 hours a week lowers chances for college graduation. Nevertheless, Sampson took under-the-table jobs that ultimately paid for a few months of hotel stay. Related: A higher ed group that wants to sign up the students least likely to succeed? After opportunities and money waned, she found Covenant House – the youth homeless shelter in New Orleans – where she learned about Liberty. “I have no previous job experience; I never worked before so it was very difficult for me,” she said. Sampson isn’t alone in this regard. More and more college students find themselves homeless and hungry. At 18.2 percent, the New Orleans metropolitan region’s percentage of youth between the ages of 16-24 who are out of school and/or out of work exceeds the national average of 13.8 percent. “Disconnected youth” or “opportunity youth” are the jargon that’s used to describe this circumstance. In 2012, The Data Center of New Orleans calculated that the number resulted in about 14,000 people who fell into this category. In comparison, Liberty reported it has enrolled approximately 500 people since its inception in 2009. Liberty is funded by local and national foundations including the Baptist Community Ministries, the Conrad N. Hilton Foundation, the Emeril Lagasse Foundation and the W.K. Kellogg Foundation (Kellogg is also among the funders of the Hechinger Report). 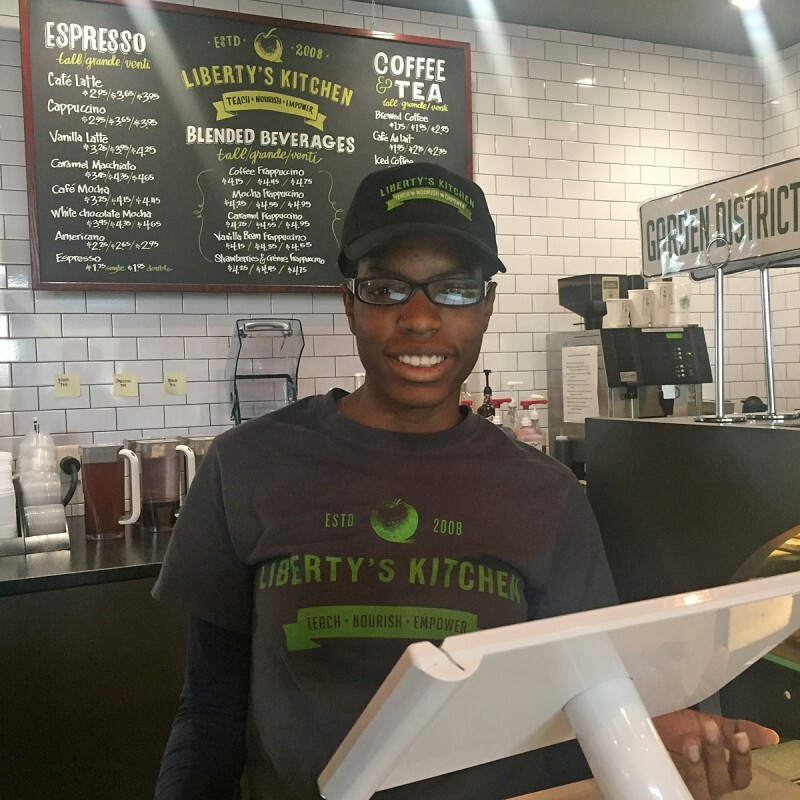 Liberty also operates two cafes, catering, school nutrition programs and a partnership with Whole Foods Market. 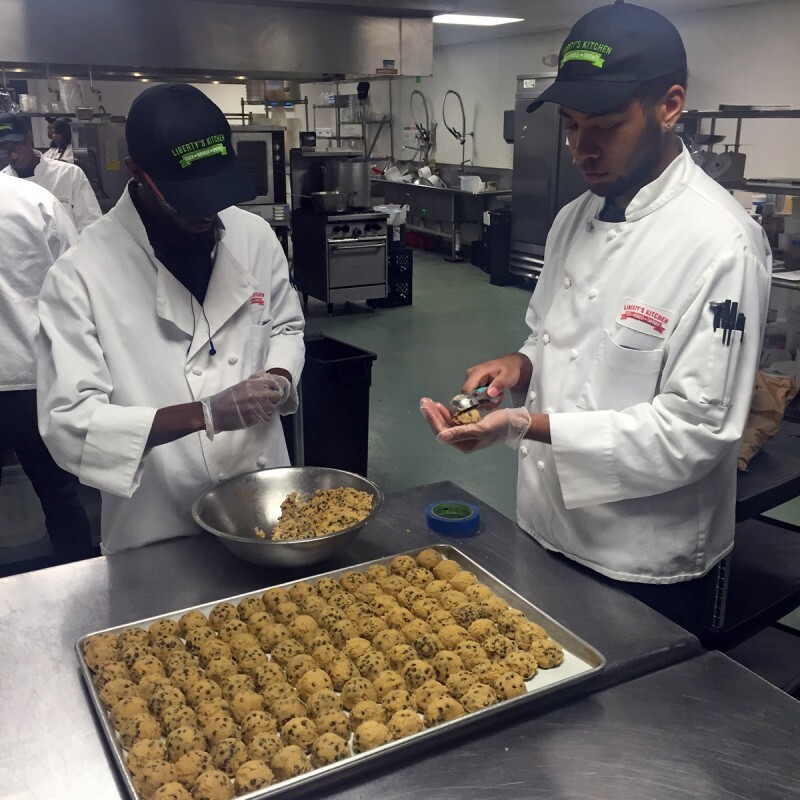 Students train and learn in all ends of the business with the help of chefs, social workers and career readiness instructors. 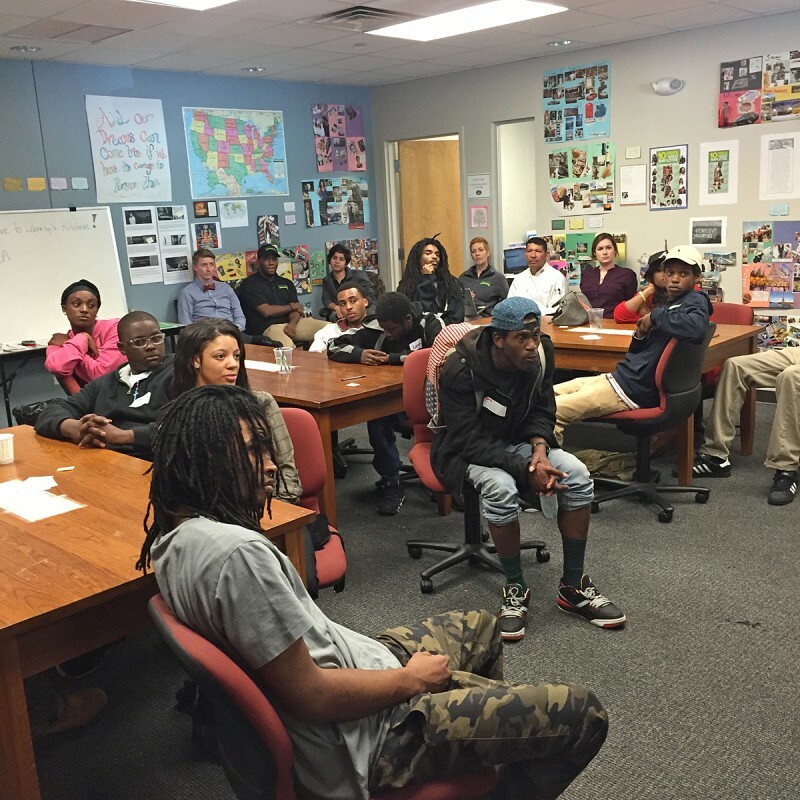 Liberty enrolls 12 to 14 youths every five weeks. Last year, it enrolled 96 in total and graduated 36 from the program. Thirty-one participants were placed in jobs (all but two remained in their jobs or in school). But the pressure to graduate more students comes from external and internal sources. “Not only do we have a responsibility to our youth to move the number of graduates from 5 to 10 in each class, but the city as a whole needs growth as well,” said executive director David Emond. Emond could be referring to the staggering employment rate of just 57 percent among black males in New Orleans, the child poverty rate of 43.8 percent or the percent of children under 18 with at least one working parent in New Orleans that is 80.7 percent compared to 90.4 percent in the United States. And violent crime seemingly is fossilized in the amber of unaffordable housing, limited educational opportunities and unemployment. The policy beat-down our youth receive is barefaced and present on their physical bodies and minds. I sat in on the first day of orientation and I could see and hear the range of challenges individuals and staff will continue to face. During a session that felt more like the first day at a self-help group, some students sat on the edge of their seats while others could barely keep their heads up. The new class of 13 stated reasons why they chose Liberty. One person shared that he didn’t have a choice. “My parole officer told me to be here,” said a young man. Students also arrived out of tenuous family situations, drug dependency and a host of other challenges. Journaling, small groups and one-on-one counseling helped Sampson’s personal growth develop alongside her food service skills. One may think that Sampson’s story is as unique as it is exceptional. However, thousands walk in her shoes. Her recent and distant history suggest that all she and other youth need are opportunities. Liberty is sadly the only unique aspect of her narrative. Sampson’s journey accentuates the fact that there’s nothing wrong with our youth. We need more programs and public policy to behave like Liberty, which simply provides opportunities for youths’ talents to be made apparent.